It's been another great week at #NTPoC. We've had fun posts on mapping our social networks as well as ongoing conversations related to student engagement and openness. With regards to the latter, Laura Gibbs has created a really useful resource for us -- the #NTPoC Inoreader feed. "This is a display of my Inoreader feed for #NTPoC. 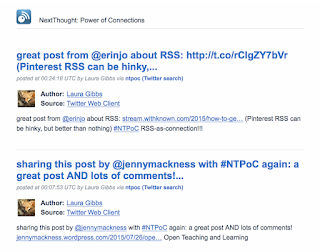 It combines items from people blogging for NTPoC along with Google+ and Twitter hashtag searches for the Power of Connections course. This same content is also available as an RSS feed. And please use the hashtag #NTPoC to share and connect at Twitter or at Google+! 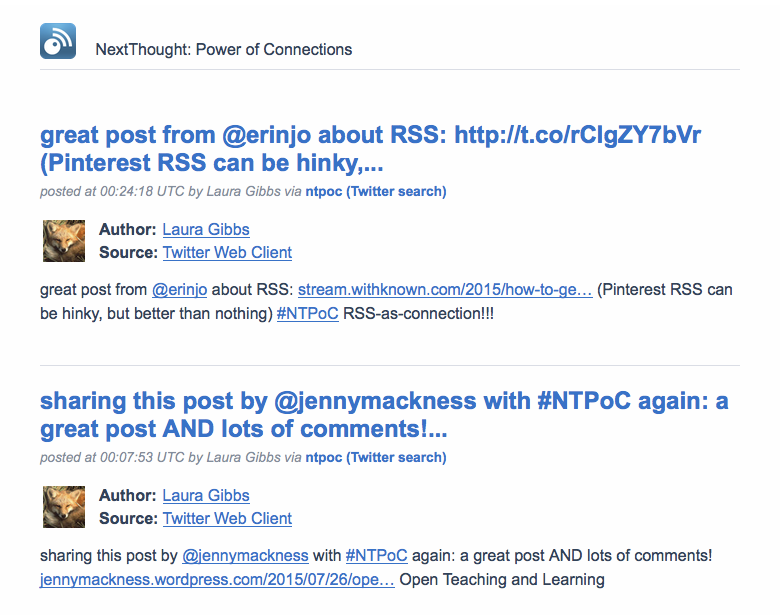 You can see an #NTPoC hashtag Twitter widget at the Power of Connections blog. For more, see Laura's homepage at MythFolklore.net." it's working!!! This just showed up already tagged in the feed. Whoo-hoo!!!!!!!!!!!! I am so glad you picked this unambiguous hashtag term. It should make the public search really productive. Just shared also Alec Couros's great piece on open course design... did you see that? WOW. It should have gone automatically into the feed. I'll go check! Yes, I see it in the feed. Great post piece from Alec Couros. Since this blog is 100% dedicated the NTPoC, I went ahead and subscribed to the comments also! I usually don't subscribe to blog comments but since this is a dedicated blog, that should work. Let's see if this comment shows up...! Fingers crossed.